"Inherent to and at the very core of the right to a fair criminal trial under Article 6 of the European Convention on Human Rights is the concept of equality of arms (procedural equality) between the parties, the construct given detailed and innovative treatment in this book. As a contextual prelude to more specific analysis of this concept under Article 6, certain influential historical developments in trial safeguards which mark a centuries-long evolution in standards of, and the value attributed to, procedural fairness are identified to establish a background to Article 6 before its inception. 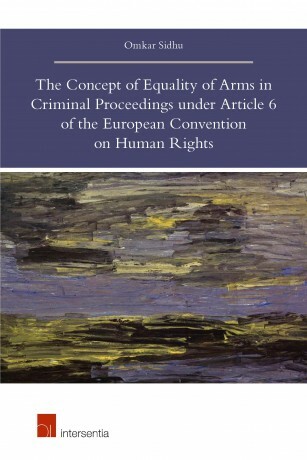 Thereafter, the book offers a thorough theoretical insight into equality of arms, investigating its multi-faceted value, identifying its contemporary legal basis in Article 6 and in international law, and defining its fundamental constituent elements to elucidate its nature, including its underpinning relationship with Article 6(3). The book argues that the most important of these constituent elements––the requirement of ‘disadvantage’––is not equated by the European Court of Human Rights with inequality in itself, which would be a dignitarian interpretation, but with inequality that gives rise to actual or, in some circumstances, inevitable prejudice. This proposition is the golden thread running through the analytical heart of the book’s survey of case-law in which the Court’s approach to procedural equality in practice is demonstrated and assessed within the context of the Article 6(3) rights to challenge and call witness evidence, to adequate time and facilities, and to legal assistance. The end result is a book for both scholars and practitioners that will not only forge an enhanced general understanding of procedural fairness safeguards and standards, including from a historical perspective, but also provoke, more specifically, new reflection on the concept of equality of arms."